In just over three decades, Metallica has written ten studio albums. They’ve won nine Grammy Awards and were inducted into the Rock and Roll Hall of Fame in 2009. They were the first band to see five studio albums debut at No. 1 on the Billboard 200, and they’re a SoundScan top five best-selling music artist, with close to 54 million albums sold in the U.S. alone. The Greatest Feeling on Earth begins with a dream. It’s accelerated with passion and enhanced by determination. Lars Ulrich says he came to the United States to do one thing: he wanted to play tennis. “I was foolish enough to believe I could play tennis in America at a competitive level. That lasted about 12 minutes or so when I landed here. And so, I just threw myself head first into my other passion, my hobby lurking in the wings, which was drumming and music,” Ulrich says. Ulrich’s story of finding music shares many similarities with millions of new musicians around the world. “I’m an only child, and I was a kind of a loner when I was a kid. Being in a band gave me a sense of belonging to something that was bigger than myself. I always loved the gang mentality of it, the strength in numbers and feeling like I was part of something with other people,” Ulrich says. Within a few months of meeting James Hetfield through a musicians’ want ad in the newspaper, hanging out with him, listening to records and playing around on riffs and drum patterns, Ulrich says he began to see music as something he enjoyed on many levels. With his passion for music in full bloom, Ulrich worked two jobs, and began saving for the drum kit he had been thinking about for some time. “I was a cashier at a gas station and an L.A. Times newspaper delivery boy. This was the first year of Metallica, and I made enough money to buy a drum kit. I was super psyched. “We went on the road in early ’84, and the drums were stolen before a show somewhere in Boston, which was kind of crazy. James lost prized gear. Everybody lost prized gear. When you’re 20 years old and ready for whatever, you don’t get stuck in those type of things. But, looking at it now, having my own first drum kit made me very proud. Q Prime had signed Rush to their record deal at Mercury about a decade earlier, so it should be no surprise that Ulrich soon consulted with Neil Peart, who at the time was the most visible Tama endorsee. “My conversation with Neil Peart was awesome,” Ulrich says. “Tama always had the reputation for making the sturdiest drums and hardware, stuff that holds up night after night and gig after gig. Metallica gigs are pretty physical undertakings and I’ve never had a single worry about Tama gear. I think I’ve been playing Starclassics since they came out maybe 10 or 15 years ago. 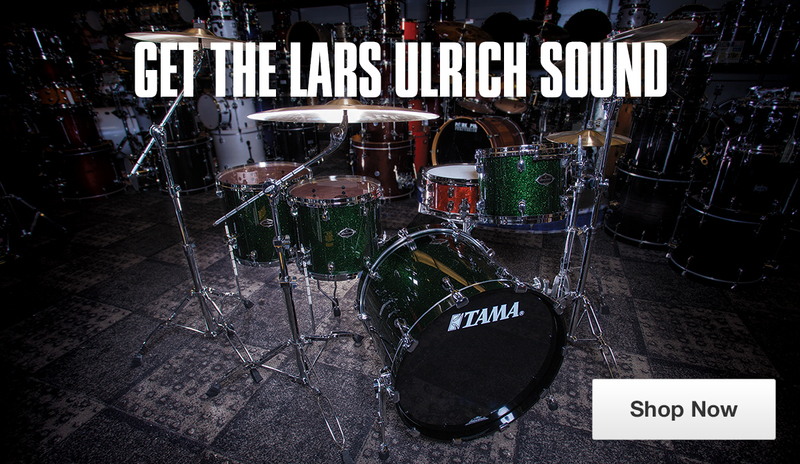 Ulrich’s signature Tama snare drum features a bell brass shell covered in diamond plate, which he says delivers thunderous crack to cut through the mix. For cymbals, Ulrich says he’s been playing the same sort of cymbals his entire career. And he’s been with Zildjian since the beginning. “Now they’re called the A Series, but back then they were just the regular Zildjians. Over the years they’ve added a little bit of sheen to them. I play medium and medium-thin 17, 18 and 19” crashes. Very straightforward. I think I’ve had the same cymbal setup for at least over a decade. Again, it’s about dependability and durability,” says Ulrich. Ulrich says he began his career playing wooden sticks, and loved the feel, but ended up breaking a dozen or so every night. A conversation with Matt Sorum led him to try alloy sticks, which he says break every couple of weeks. “I played wooden sticks up through the ’80s and early ’90s. They were just too undependable, and when you’re playing some of the fast songs and some of the super crazy songs it’s just really, really difficult to change sticks. Not surprisingly, Ulrich says he has been playing Remo heads for about two decades as well. He says he’s always played a coated Ambassador Reverse Dot head on his snare, but has experimented with tom heads for different sounds and moods, but always Remo. “The main thing for me is, I don’t want the gear to get in the way of the experience in a negative way. So, by using Tama, Zildjian, Remo and Ahead, I just know that it’s always going to work. I appreciate the relationships I have with those guys. There’s loyalty in both directions. They support me and I support them,” says Ulrich. 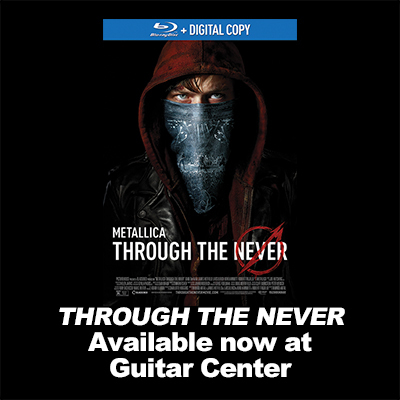 In 2013, Metallica released its second film, an IMAX concert movie titled Metallica Through the Never, which tells the tale of a heroic roadie who battles evil in a rush to retrieve a bag for the band. The band’s first film, Some Kind of Monster, documented the process—and tensions—of recording the band’s St. Anger album. “We had always wanted to do a Metallica concert movie. Increasingly, for Metallica, it’s about having sort of different ways to express yourself and communicate with the audience, and I think that it’s making music—we love making music. We love being in the studio but it’s also—it can get sometimes a little one-dimensional, so [experiencing a different creative process] keeps you from going on autopilot. Film, I think, is an interesting way for a band to communicate with the fans. “We had all the creative control. We produced it ourselves. We financed it ourselves. Every frame in that movie comes directly from Metallica in one way or another. Every single thing that’s in there is us,” says Ulrich.